Pugs are fun, wonderful and mischievous as Sam and I witnessed when we fostered 2 for a couple of days. But as you can see in the image above from NPR, Xander the pug is quite unique. This little guy is blind; a tough mishap that his owners Marcie and Rodney Beedy turned into a blessing. 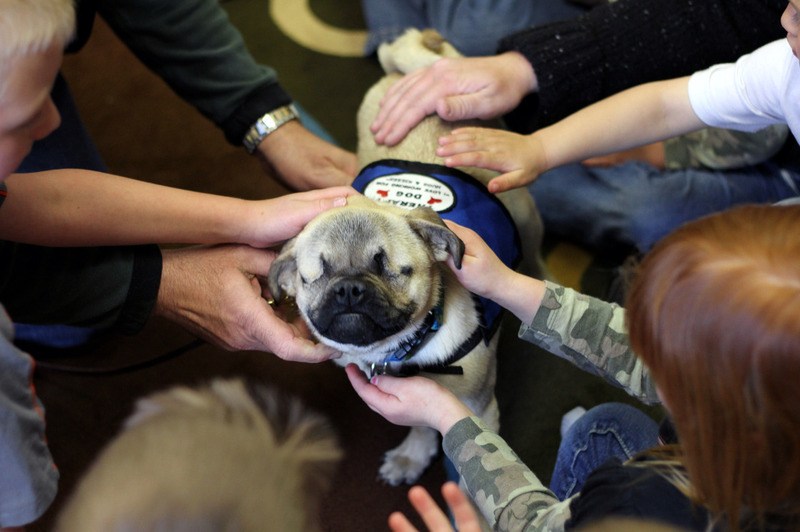 The couple adopted Xander and soon realized that this lovable pug enjoyed comforting others. Seeing the potential and a creative opportunity, the Beedy's recruited Xander to help comfort abused children and adults who need companionship. Cheers to Xander, the super pug! Next on our list is this random video from Dangerous Minds. It's kind of bizarre but I couldn't resist sharing it—partly because of the old man waving away the person shooting the video. Anyways, we need to give props to any dog willing to push his or her owner through high water on 2 legs. That dedication is a perfect example of Josh Billings' quote above. Last but not least, is Kia, the little puppy that survived being in an impounded car for almost a month located in Kansas City. Without food or water, she managed by living off the trash that was left behind. Luckily someone found her before the weather heated up. A true survivor and now a star, thanks to Rachael Ray who caught wind of the story and had to share with her audience. Check out the clip here. All these stories are good reminders that where there's a will, there's a way will hold true. Hats off to all the dogs out there pushing forward. Have a story to share about defying the odds? Please comment below. Would love to share more inspiration!